I went last week to see the documentary movie L'Amour Fou about Yves Saint Laurent and Pierre Bergé, and tucked myself into a tiny IFC theater on Sixth Avenue. You know that the great Saint Laurent died in 2008 and that Bergé was his partner in life and business. 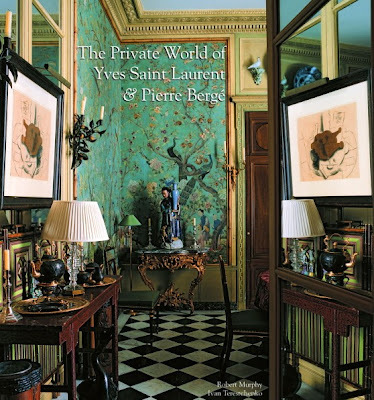 This documentary is largely about the auction that Bergé and Christie's held at the Grand Palais in Paris in 2009 to sell off all of the art and antiques and possessions which he and Saint Laurent had bought over the years. 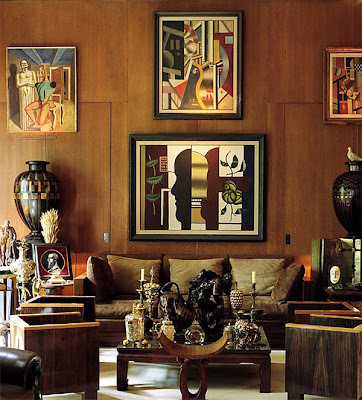 For they had amassed an extraordinary collection including works by Picasso, Braque, Matisse and Mondrian. The couple had houses in Paris, Morocco, and Normandy, all filled with art and antiques. 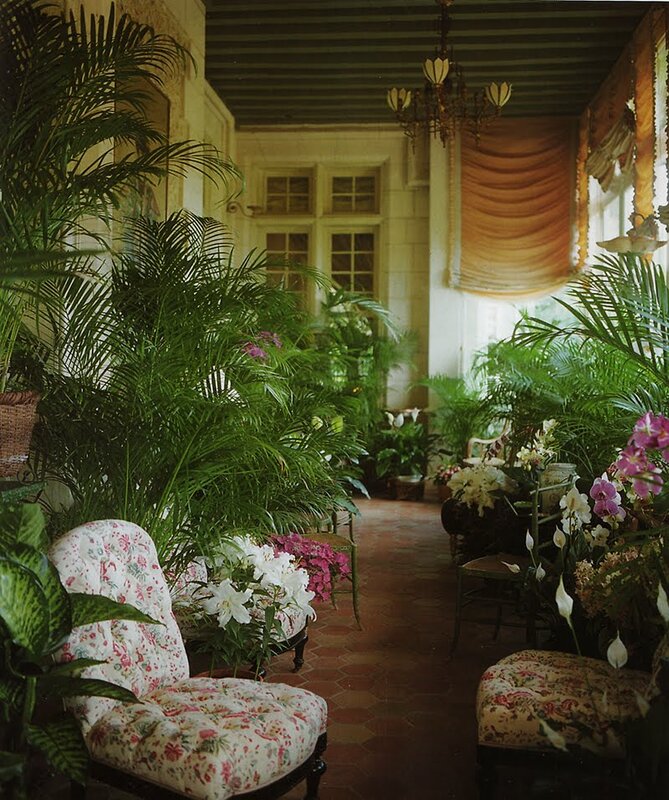 The house in Morocco (pictured below, the Paris house is pictured above) was dreamily decorated by Jacques Grange in the Edwardian style of Marcel Proust. This collecting is the L'Amour Fou, the mad love, of the movie's title. After Saint Laurent died, Bergé wanted to unload it all, or most of it. By the movie's end, the auction is over, having made $483 million, almost a half billion dollars, though the movie does not note the figure. Bergé said that some of the proceeds would go to AIDS research. But of course the most fascinating part of the movie was Saint Laurent himself, the genius who defined the world of fashion in the last half of the twentieth century with his fantastic couture confections, strong pant suits, and tuxedos for women. The movie portrayed his quick rise when he found himself at age 21 named head designer at Christian Dior after Dior died. Soon after that he and Bergé founded the house of Yves Saint Laurent and he held the fashion world enthralled for the next thirty years. In the seventies though the designer suffered from depression and the effects of alcohol and drugs. That is when he launched his new fragrance called Opium. And then the movie stopped. I don't think I've ever experienced that in a theater before. A manager ran in to inspect. I was waiting for the film to melt in the lense but of course movies aren't made on film anymore. The manager said, "Sorry about these mechanical issues which are being caused by the intense lightening story outside." We – there was a handful of us in the theater – looked at each other; what lightening storm? He said, "You can have a complementary pop corn or drink." The pop corn turned out to be organic and topped by natural butter – very tasty indeed. and his Chinese collection. 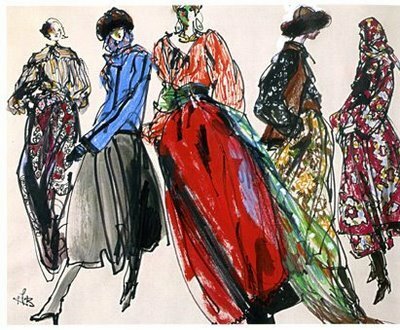 He changed the way women dressed with his fantastic colors and exoticism. You see glimpses of it in this movie and I would loved to have seen more. But I did enjoy the movie and visiting the beautiful if somewhat melancholy world of Yves Saint Laurent and Pierre Bergé. Even when Saint Laurent was seriously crippled he was an extraordinary artist. Thank you for the "film clip" of "L'Amour Fou of Yves Saint Laurent", a movie I will never see. I keep looking to see if our little theater will offer "Midnight in Paris". Not even that, so far. I don't think our theater owner/manager would know what I was talking about should I suggest either of these movies. The big summer blockbusters like "Hangover 2" is the usual fare. Can't blame him really--15 year olds keep him in business. So, thank you Bart. Tragic life was Yves'. I wonder if he was ever happy. It was a wonderful movie, even with the melancholic undercurrent. The house featured at the beginning of the movie trailer -- do you know if there are any pictures of it elsewhere? I would love to see more, including the surrounding grounds. Hi Gail, That house in the beginning is the house in Normandy. I think World of Interiors photographed it, if you google it. Believe it or not, it's being shown On Demand. Saw it last week in the comfort of my home. Although I enjoyed it, I much preferred Valentino, The Emperor. A little more upbeat and at times funny. Of course the clothes, homes, pugs, divine. I love your blog! 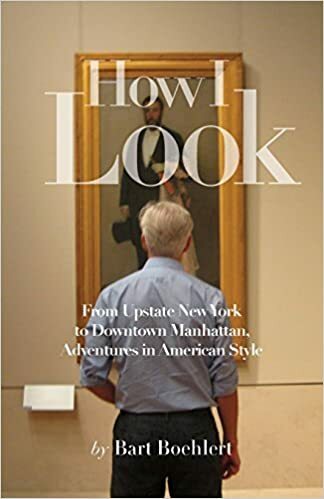 It makes me feel like I am back in Manhattan, living my glamorous life, east sixties, working as a designer...my hairdresser here in Naples once did hair for YSL shows in Paris! Hi Gail, That house to start with is the house in Normandy. I suppose World of Interiors captured it, if you google it.